For a brief discussion of the subject, look here. When Wolfpack announced this F-5A in 1/48th scale, I was curious to see how it would stack up against some of the other quarter-scale F-5A kits on the market. When I opened the box, I was having a feeling of deja vu until I had a blinding flash of the obvious - this is the Kinetic kit in a Wolfpack box. First, you can see the original release of the Kinetic F-5A kit here. You'll recall that Kinetic put two left tip tanks in the kit and no right tank. 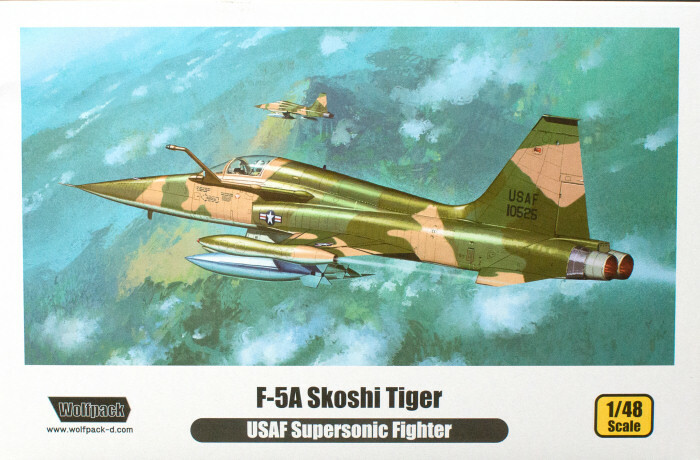 This was corrected in their F-5B release and I believe in their current production F-5A kits. This kit also has the new right wingtip tank included by Kinetic. Wolfpack added a new resin ejection seat with pilot restraints cast onto the seat, a more accurate air refueling probe, and a small fret of photo-etched parts which provide the instrument panel and the gunsight. These are nice enhancements and if these are all the improvements needed in the Kinetic kit, then the Kinetic kit is still an oustanding kit! This kit goes together quite nicely. You can see our quick-build review of the Kinetic release here. Whether you buy the Kinetic kit or this enhanced release from Wolfpack, you've got the best F-5A option on the market.